A Family Business, Serving You and Your Family in the Greater Tampa Bay Area! Luigi Kalaj, a full time successful Real Estate Professional for over 32 Years. An international Marketing Specialist and a Top Realtor in the Tampa Bay Area year after year, with proven results to his commitment to the Real Estate Industry. Luigi strives to meet his goals and yours, the consumer. Luigi is the Tampa Bay Area Listing and Marketing Specialist. In addition Luigi has also held a builders license for over 30 years. Luigi Kalaj’s philosophy has always been, “under promise and over deliver to his customers.” 80% of Luigi's business is established through past customers and referrals. Luigi’s commitment, honesty, integrity and hard work, a proven success! 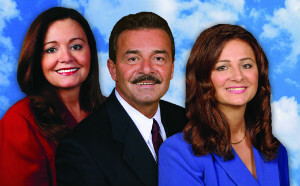 Luigi Kalaj & his Team with over 50 years of combined Real Estate experience. When it comes to selling your home Hiring the right Realtor Matters! Why not hire the Best, Hire the area Specialists, Luigi's Team to Market Your Home and Consider it SOLD! Luigi Kalaj is a Tampa resident of over 30 years years. Luigi, Lucia & Anna continually support several non-profit organizations, public school foundation, Children's Miracle Network, Habitat for Humanity and Susan G. Komen race for the cure. Lucia Vulaj, Luigi’s associate and sister, a full time Residential Real Estate Professional since 1994. Lucia has been in the top 1% of Realtors Nationwide, She holds an Broker Associate Licence, Lucia is knowledgeable, dedicated and she has outstanding negotiating skills! Anna Gjurashaj, Luigi's and Lucia's associate and sister, Anna has been a Top Real Estate professional, a full time Residential Realtor working along-side Luigi since 1999. Anna is Knowledgeable, dedicated and efficient! Personalized service and commitment is what you can expect in your real estate transaction. When it comes to purchasing your new home why not hire the Best. Hire the area Specialist, Luigi Kalaj & Team to find your dream home! RE/MAX was co-founded by Dave and Gail Liniger in 1973. From a single office in Denver, Colorado, RE/MAX has grown to be a global network of nearly 100,000 Sales Associates in more than 70 countries. No one in the World sells more real estate than RE/MAX.